Breast implants don’t increase your chances of developing breast cancer–but they don’t prevent it either. When you have breast implants, routine breast cancer screenings (and related diagnostic procedures) can be a bit more involved. “It is not as simple as putting in the implants and you’re done,” says Jay Baker, MD, chief of the division of breast imaging at Duke University Medical Center in Durham, North Carolina. “Downstream issues,” like how implants affect regular screening mammograms, often aren’t discussed in as much detail as they should be when a woman has implant surgery, he explains. While breast implants don’t boost the risk of developing breast cancer, they don’t prevent it either. Breast cancer risk is tied to such factors as being older, being overweight, having a family history of breast cancer, or inheriting certain genetic mutations linked to breast cancer. National guidelines suggest that most women have screening mammograms annually or every other year beginning between age 40 and 50, whether or not they have implants. One caveat: The National Cancer Institute says a woman who has had an implant after a mastectomy should ask her doctor whether she needs a mammogram of the reconstructed breast. Have implants or thinking of getting them? These facts and tips may help you navigate your regular breast cancer screenings and any related diagnostic testing that your doctor recommends. If you’ve had breast augmentation or reconstruction (or you’re considering one of these procedures), get to know your new normal. “We do recommend that if a patient has an implant in place that she become familiar with the implant,” says Sameer Patel, MD, associate professor in the department of surgical oncology at Fox Chase Cancer Center in Philadelphia. Talk to your surgeon about how you can tell what is breast tissue and what is implant, he advises. A recent study in the journal Plastic and Reconstructive Surgery suggests that breast cancers are likely to be detected at smaller sizes in women with breast implants, especially palpable lumps found by self-examination or during a clinical breast exam. The study involved 48 women who developed breast cancer after implants and 302 women with breast cancer but without implants. The X-rays used in mammograms don’t sufficiently penetrate saline or silicone. So, depending on where a cancer is located, it can be tougher to find on a mammogram. “It is manageable; we do it all the time, [but] it definitely makes things a little trickier,” Dr. Baker says. In the same Plastic and Reconstructive Surgery study above, the rate of cancer detection by screening mammography was actually lower for women with implants (77.8%) versus women without implants (90.7%). If you have implants, say so. Tell the scheduler when you make an appointment for your mammogram. Make sure the staff has experience screening women with implants. And give the mammogram tech a heads up before your imaging procedure begins. “The technologist needs to know two things,” Dr. Baker says. “One is how to position her.” There are extra steps involved in screening a woman with implants (more on that below). The other is how much compression to use. According to the Radiological Society of North America (RSNA), an experienced technologist will know how to carefully compress the breasts of women with implants without risking rupture. The standard mammogram is two views of each breast—a total of four pictures. But women with breast implants typically require a couple of additional views of each breast. The extra views are gathered to detect cancers that might be obscured by the implants. “They’re called implant displacement views,” says Dr. Patel, a member of the National Comprehensive Cancer Network’s Guidelines Panel for Breast Cancer. The breast is drawn out, pushing the implant toward the chest wall “so more of the breast tissue is visualized with the mammogram,” he explains. Implant displacement views involve relatively little compression, “just enough to keep the breast still,” Dr. Baker notes. Worried that your implant might burst under compression? It’s not a common occurrence. A 2004 study in the Journal of Women’s Health examined problems with mammography for women with breast implants. When researchers reviewed adverse events reported to the U.S. Food and Drug Administration (FDA), they identified just 44 incidents involving breast implant rupture with mammography. In a separate review of published studies, FDA researchers identified another 17 cases involving breast implant rupture during compression. Yet there are almost 300,000 women who undergo breast augmentation each year, says the American Society of Plastic Surgeons. Mammography remains the tool of choice for breast cancer screening. But sometimes doctors recommend additional imaging. Ultrasound is not a substitute for mammography, he adds, because each yields different information. Mammography picks up tiny calcium deposits that can be a precursor to breast cancer, while ultrasound does not. Ultrasound may reveal a small mass hidden by the implant that mammography cannot detect. If a suspicious area of breast tissue is found, a needle biopsy may be done to extract a cell sample for lab testing. 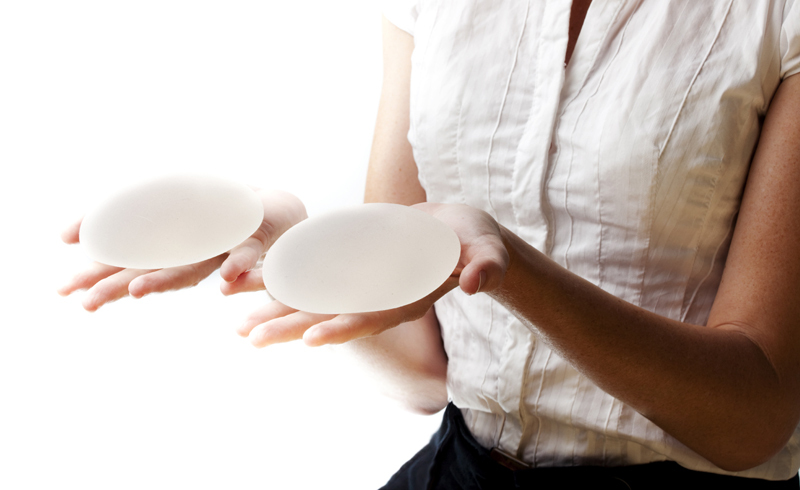 In women with implants, this can be a risky procedure depending on where the lump is located. Sometimes women with implants think they detect a lump in their breast, but what they’re actually feeling is the implant. Saline implants, in particular, can bulge like a partially filled water balloon, Dr. Baker points out. But he urges any woman who feels a lump to get checked out. Don’t assume it’s the implant and ignore it! Women with implants are at risk of developing a rare type of lymphoma called breast implant-associated anaplastic large cell lymphoma, or BIA-ALCL. The FDA says it has received 457 reports of this cancer, including nine patient deaths. At least 310 of these cases involved textured implants. The FDA is conducting a review of implant safety concerns. In March 2019, an advisory panel held a two-day hearing on the benefits and risks of the implants. The agency also issued warning letters to two implant makers for failing to conduct long-term safety studies. BIA-ALCL symptoms include pain, lumps, swelling, or breast asymmetry. Treatment usually involves removing the implants and surrounding tissue. Sometimes chemotherapy and radiation are required. Should you remove your implants if you are diagnosed with breast cancer? That’s an individual decision based on a woman’s cancer and recommended treatment. Women with implants who undergo radiation for breast cancer are at increased risk of developing something called capsular contracture. Radiation causes the fibrous tissue that develops around the implant to become hard, tight, and painful. “In more extreme cases, it can actually affect the physical appearance of the breast where it can deform the breast shape and can actually be visible through the skin,” Dr. Patel says. But there’s no need to remove implants just for mammograms. “I would never recommend that a woman remove her perfectly functioning, intact implants to improve her screening,” Dr. Baker says.